Let me first state the obvious: it's already August 8th and summer is barely hanging on by a thread. Our internet has been intermittent the last week or so due to unspecified Verizon outages. I say that as a feeble excuse as to why I haven't blogged in a while. I'd get semi inspired to post only to discover we had no internet juice flowing and by the time it came back I'd lost my interest. 01.) 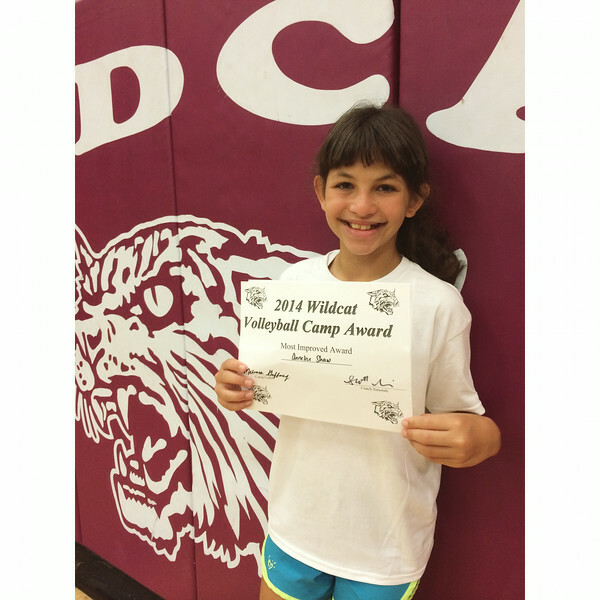 Last week Annelise had volleyball camp at my old high school. She complained at first and declared she was absolutely NOT going saying she had zero, zilch, nada interest in volleyball. This was all just a cover for the fact she was worried she'd be the only one that didn't know how to play. 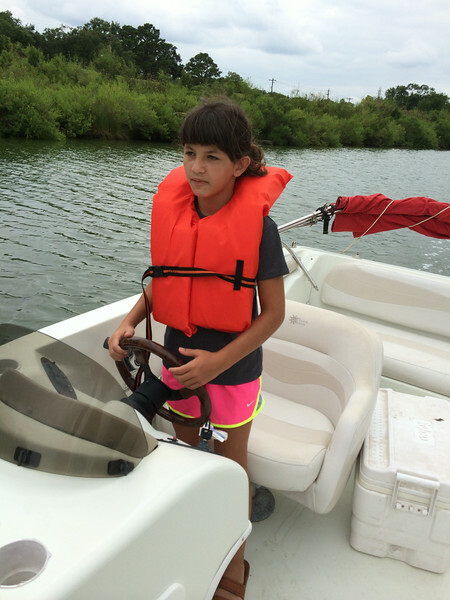 They spent the first few days learning proper form and practicing different skills. She caught on quickly and decided volleyball wasn't so bad after all, and, hey, it might even be teensy bit fun. At the end of the third morning they had a few scrimmages which were fairly painful to watch since most of the serves died a quick death and I was gathering my courage in anticipation of the tournament to cap off the camp the next morning. Well, after a rocky start her little team dug deep and started getting better and ended up winning two (although she claims it was three) games overall. Whoop! Camp ended on an even higher note when she was chosen as the most improved player, double whoop!! Now that she's done a 180 about volleyball we might check out the local AVA facility so she can keep learning and playing. 02.) Did I forget to tell y'all that Dunkin' Donuts has finally come to our area? And that we were highly excited about it? I don't know why they've never opened in this part of Texas before, but that wrong has finally been rectified. It just so happens the new DD is right across the street from the high school, so I'll give you three guesses, and the first two don't count, where we went the second volleyball camp ended. It was our first time and I will admit my expectations might have been a touch too high. I love no-nonsense coffee with an old-fashioned style doughnut (either sour-cream or chocolate). Annelise is all about the sprinkles. They got our order wrong. I'm hoping that it's just a symptom of being newly opened and having a newly trained staff. 03.) Annelise's school uniforms arrived last week from Land's End and whenever I see the ads for tax-free weekend I am relieved that the majority of her back to school shopping was done with the click of a few keys (we still need to shop for shoes, hold me). Not that I'd go shopping on tax-free weekend anyway, because, madness. Annelise is on the borderline of two sizes so I bought everything in the bigger size, my rationale being she would be able to wear things all year, maybe even into next year, since the shorts and pants have adjustable waists. She thinks I did this to ruin her life. At least her 5th grade life. 04.) 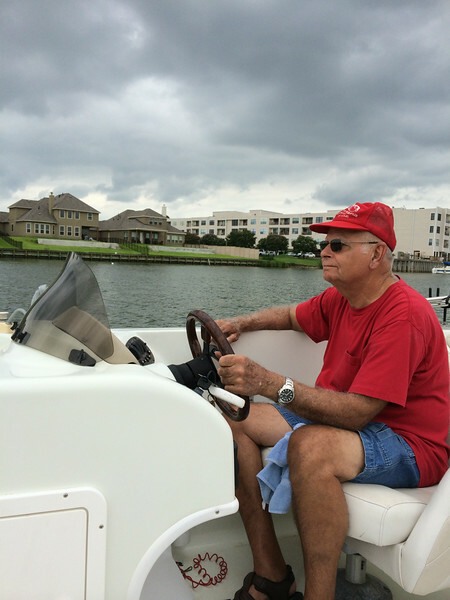 Last Saturday my dad bought a boat. They took it for a test drive. 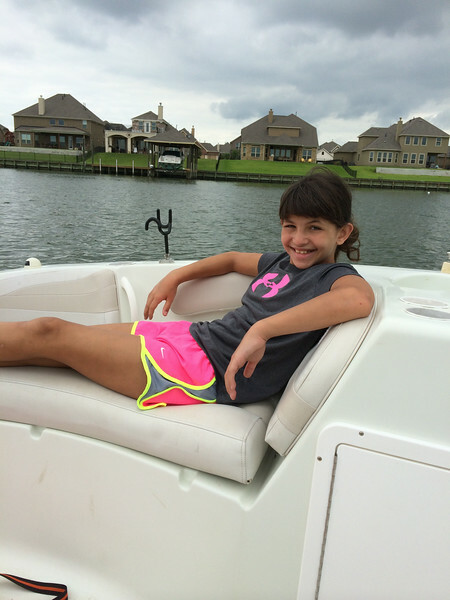 Annelise thought she was HOT STUFF getting to be captain for a while. Then they (Scott and my dad) had a lot of trouble getting it back onto its trailer (the style is different from boats my dad had in the past). Saturday night the boat went back to its owner. The boat was once again on my dad's back acre. He decided to get the trailer modified because ultimately, he really liked that boat. We're supposed to take it on a tester ride this weekend. Hopefully this saga will have a happy ending. 05.) 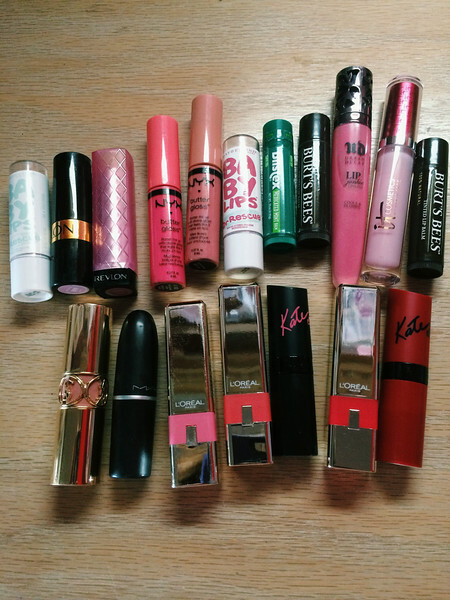 In case of a lipstick apocalypse I will be prepared. This stash was split between my bigger purse and my cross body bag, but still...ridiculous. Most of these are in the same color family, pinkish nudes, with a few brighter shades that I end up hardly ever wearing but am always tempted to buy. I also seem to be terrified of chapped lips, what with the five lip balms (three of them tinted) and all. Nothing cheers a girl up like a new lipstick. 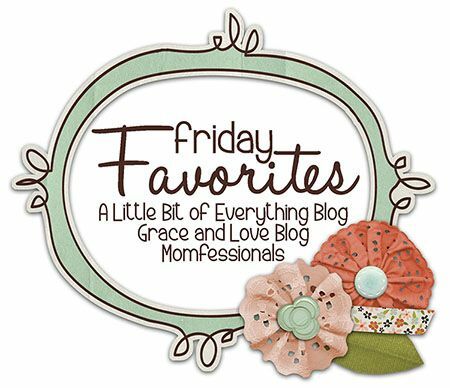 I'm linking up with Andrea at Momfessionals for Friday Favorites, pop over there for more fun! 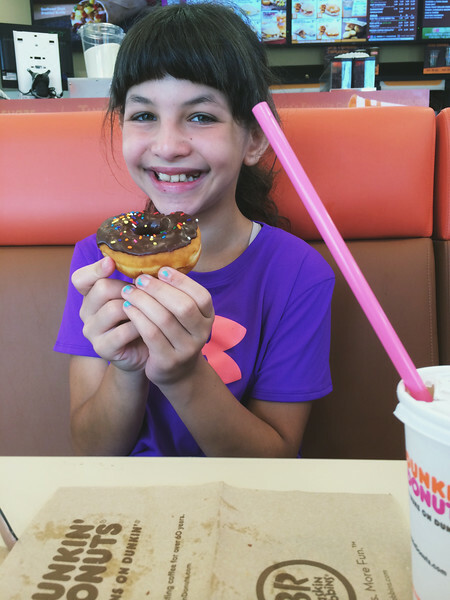 Hooray for Dunkin Donuts! But honestly, they do frequently get the order wrong. At least that's the case in my part of NY!